Considering the amount of time Americans spend “at the office,” it comes as something of a surprise that Nikil Saval’s Cubed: A Secret History of the Workplace is the most comprehensive take on life at the desk since 1951, when C. Wright Mills wrote White Collar about the silent rise of office dwellers. Now, with Cubed, Saval chronicles the office’s history from the post‑Industrial Revolution’s “unmanly clerking class” to the “non-territorial” and “managerless” offices of today. Rather than coming out swinging, Saval is a connoisseur of mild horrors, withered souls, and unfulfilled needs. He carefully cultivates the “unholy postwar calm” of offices like IBM’s, where workers labored in rows, wearing the mandated dark gray suits and black ties, under an image of the CEO, with the Orwellian company slogan behind him that read simply, “THINK.” And though the normality of office work may seem immutable today, Saval conjures a time when office workers were eyed with suspicion as effeminate wimps: clerks “spent their minimal strength attempting to dress better than ‘real men who did real work'”, one nineteenth-century journalist proclaimed. In Cubed, history appears to be playing on repeat. The invention of the typewriter and telecommunication foreshadow email, all three of which were initially heralded as time-saving devices but “paradoxically…resulted in more and more work.” In each era, the office offers “freedom — the road to paradise,” but each time, satisfaction proves elusive. Often the very mechanisms meant to free us become snares — the archetypal example being the office cubicle. 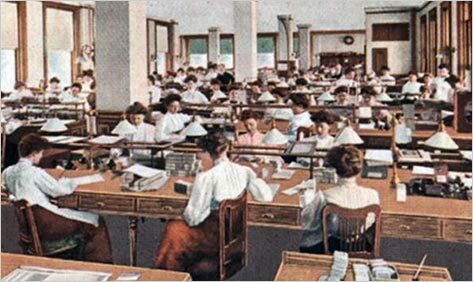 Originally intended by its designer, Robert Probst, as a private enclave that the worker could arrange to his pleasing, the cubicle became a despised symbol of white-collar monotony. Cubed‘s most compelling moments are composed of human drama, such as Helen Gurley Brown’s campaign to empower female office workers by encouraging them to use the office’s sexual tension to their own advantage (according to Brown, “offices are sexier than Turkish harems”) or the case where an office worker shot his fiancée when she changed her mind about the wedding after being taken out by office superiors. But occasionally, the study of tedium makes for tedious history, especially in the chapters on the advent of the skyscraper or floor plan engineering, which are steeped in dry design theory. However, in most places, the book is enlivened by vivid, weird, and sometimes downright appalling anecdotes, such as the one about a 1950s office game known as “scuttle,” in which male office workers chase an unsuspecting secretary and steal her underwear. Saval is at his best when he draws on his encyclopedic knowledge of literature and film, from Walden and The Man in the Gray Flannel Suit to Working Girl and Dilbert, to create a sense of how each era defined work and the workspace. Offices where people thrive are afforded little space in Cubed. Saval does, however, take some hopeful stabs at futurology by visiting revolutionary modern offices in Silicon Valley and Amsterdam, among others. The good news for those entering the rat race now is that employers increasingly value worker satisfaction, and some experiment boldly in its pursuit. GitHub built its employees a secret passageway to a speakeasy, and Google — whose offices offer beach volleyball courts, free food, and a resistance pool — is trying out ten different lighting systems “to see which work[s] best for the Googlers.” Saval is tight-lipped on whether these changes, along with a rise in freelance work, offer a meaningful salve for the white-collar soul. Are freelancers (who by some estimates will make up half the work force by 2020) liberated from the workaday shackles of the office? Or are they trapped on a “precarious path of nearly permanent underemployment”? While it is unclear exactly what form the office will take (or if it will exist at all), rest assured that “a new sort of work” looms large on the horizon.